When I was farming, at first it surprised me how much farmers love conferences—just like everybody else. Isolated most of the time, farmers liked to get together, have a learning vacation, stay in a motel with a pool for the kids. I already knew they’d adopted the digital world, its message boards and email lists. Just like writers, whose own conferences bear a striking similarity—though lacking booths devoted to kelp meal and artificial insemination. The mother of all writing conferences, AWP, is a fearsome thing. Last time I went, a few years ago, there were 8,000 writers, students, teachers, editors, agents, and publishers milling about. The only way for a soul like me, timid as a sheep on a daily basis, to enjoy such a confab would be if I had a book coming out. Or was speaking on a panel. Or had more friends than I do. AWP’s panels, often witnessed from a great distance, are great, however. Famous or mid-career or baby writers burst with helpful insights for their listeners. I still refer to the notes I took. I was ripe for it, which is the only way to saddle up for AWP. I also remember being jammed shoulder to shoulder in presentation rooms. And being shut out of others. And the crowds at elevators. And the trashed basement feedlot. The best writing conferences . . .
. . . are small writing conferences. At the end of May, I attended the River Teeth Nonfiction Conference, in Ashland, Ohio. The fine literary magazine River Teeth: A Journal of Nonfiction Narrative is published there, at Ashland University, which also is home to a new but strong and emerging low-residency program in poetry and creative nonfiction. River Teeth’s was a hugely helpful conference. It fostered involvement and intimacy and collegiality. The speakers gave fresh presentations, packed with ideas. The headliners included Robert Atwan, Bob Cowser Jr., Jill Christman, Hope Edelman, Walt Harrington, Michelle Herman, Kate Hopper, Sonya Huber, Dan Lehman, Joe Mackall, Dinty W. Moore, Ana Maria Spagna, and Sarah M. Wells. They engaged with attendees during their sessions and also at social hours. Everyone sat together at meals. Friends and presenters tended to sit together, sure, but there was room for you. It felt like all of us were buddies, really. People who shared the same passion. The energy was infectious. Attendance came with an hour-long writing consultation, and I was humbled by the insight and generosity of my mentor, Ana Maria Spagna. Others whose work was critiqued told me the same thing. My fellow attendees were an impressive group from across the nation who generated more excitement. I left with new tools, new buddies, and inspiration. 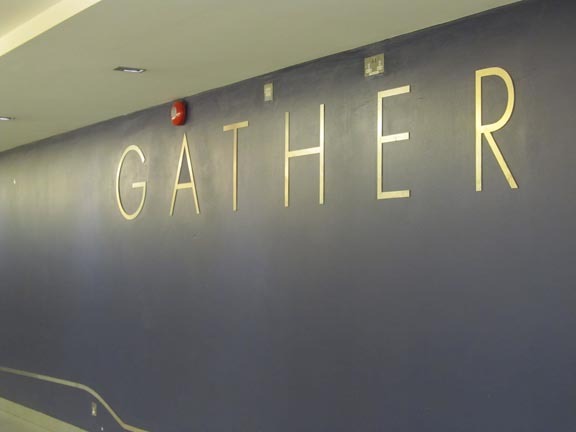 Watch for River Teeth’s next conference—planned to be an annual event. Indiana is known for peonies, thunderstorms, and fat sycamore trees. And for its cuisine: fried baloney, corn on the cob, pie made with Crisco. Like Missouri, it’s a state of small towns, everybody more or less equal, united by religion: basketball. Indiana is really a cool state, like Maine. Well, not cool, but nice, and that’s uber cool, actually. And it’s a state known for spawning some great writers and musicians. As a once and maybe future Hoosier—I lived in the cultural oasis of Bloomington for thirteen blessed years—I know these things. I read about MWW on the Hoosier writer Cathy Day’s blog. Let’s face it, it’ll be broiling out there in those cornfields around Muncie. But that has the virtue of concentrating your mind. And thankfully, there are no misty mountains, rocky seacoast, or lobster to distract you. There are one-day intensive sessions on genre and about thirty on aspects of craft. There’s also a big emphasis on getting published and pitching agents; Jane Friedman will discuss digital publishing. Sorry for the late notice here—manuscript consultations are closed—but this conference is one to consider, now or next year. Boutique gatherings take writers’ meetings to their highest level. 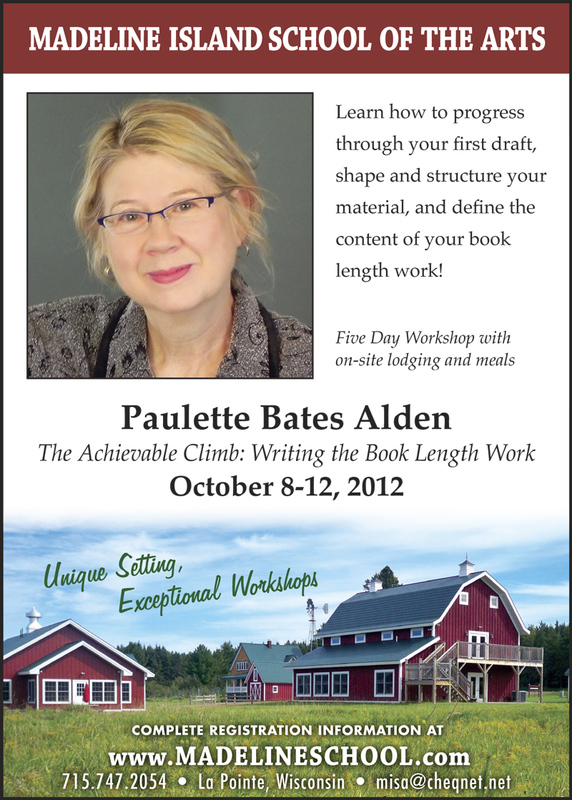 This October, my friend Paulette, author of a critically acclaimed memoir and a book of short stories, will teach an intimate workshop on book-length fiction and memoir at the Madeline Island School of the Arts in Northern Wisconsin. The dates are October 8–12th. “We’ll be tackling the usual suspects,” says Paulette: voice; structure; what to put in and what to leave out; how to find what the book is really about; where to start; how to work through drafts; and how to complete the work. October seems a long way off, but Paulette says lodging on the island fills up fast. For writers’ groups, there is a group discount if four or more sign up. Like any artists, writers need to gather to teach and nurture each other. Each writer and each generation must learn the very same things, lay the same base from which to work. The instructors along the way are many. They’re eager to help, even if that means instructing you indirectly through rejection. To enter the guild, a writer is taught and vetted by so many teachers, mentors, friends, editors, agents, and publishers. They beat the craft into your body. All this effort and hobnobbing is about reaching readers, mere civilians, lovers who may be comparatively ignorant about craft and certainly of its details that writers must absorb. Going to conferences is part of a writer’s literary apprenticeship and maybe citizenship. Of course the ideal is that eventually most of one’s teachers reside in books themselves—you study work that does what you’re trying to do. By then the craft has been internalized, freeing your art. Maybe you’ll go to teach others who are coming up. To chat with peers and commiserate, to discuss subtle aspects of craft and art’s almost incommunicable ones. Get thee to a conference and meet your tribe. Thanks so much for telling me about Paulette’s conference in October. I’m going now to check it out! Do you or any of your readers know of good conferences in or around Virginia? I can give a plug, also, for the Santa Barbara Writers Conference. It was enormously helpful to me to get my first education in the publishing and writing worlds there. I went twice and heard Ray Bradbury speak twice. He was a regular there, and I will never forget the way he narrated his career — a story of falling in love over and over again. Shirley, in VA the James River Writers group looks superb, and I think they host various events and workshops. Google them up! Thanks for mentioning Santa Barbara–a couple other writers have told me it’s a great one. I am writing a piece for the Louisiana Book Festival’s website because that is where I met my publisher last year. I volunteered to introduce a favorite author (or maybe it’s because I live on a farm), and the author introduced me to his publisher. This year I’m going back to Baton Rouge for the festival. But this time I’ll be on the list of featured authors. What a great series of events, Darrelyn. One thing I didn’t say about the “who you know” aspect is that as humans we want not only to admire someone’s work but to think she’s okay as a person. It’s not enough to be only nice and participating, of course, but one needs to be that too. This also reminds me of someone who told me she went to AWP, I think it was, and pitched her book with a proposal, at the trade show, and got a publisher. So even though it can seem discouraging that there are so many books and authors, what percentage do show up at these things where other writers, agents, and publishers hang out? What a fantastic and generous post, Richard. The usefulness of its content alone was a gift, and then you had to go and write it so beautifully — another gift of time and craft and tribal sharing. I just returned home from the Kenyon Review Writing Workshop in beautiful Gambier, Ohio, where I had the great pleasure and privilege of serving as Rebecca McClanahan’s fellow. I can’t say enough about this week. KR editor David Lynn, Program Director Anna Duke Reach and everyone on staff there have gone out of their way to cultivate an environment of intense learning, experimentation, growth and community-building. It’s different from many fine workshops in the sense that it is generative. No critique to speak of. No one bringing past efforts to workshop. But every day, incredible instruction followed by homework, which is shared in class the next day. David Lynn calls it boot camp for writers. You leave in awe of how much fun you can have working your tail off for seven days straight. It’s complete and utter immersion into language and craft. Give it a Google. Next spring, send your application and manuscript in fiction, nonfiction or poetry to the folks at KR. If you end up with the good fortune of attending, eat your Wheaties, bank some sleep and bring Powerbars. Thanks for this great report, Marsha. I had heard the Kenyon Review Writing Workshop is special. I appreciate your details and your strong recommendation. Size DOES matter, and I agree that smaller is better. The GETTYSBURG REVIEW holds an annual summer conference for writers in early June (in Gettysburg, PA). The single-genre, manuscript-driven workshops are small, which makes for an intimate overall conference. Editors from the GETTYSBURG REVIEW provide private consultations with participants. Conference faculty and fellows give readings and craft talks. And, there’s a very special participant open-mic. Visit http://www.gettysburgreview.com/conference, or check out our Facebook page. Welcome Table Press, dedicated to publishing & celebrating the essay, in all its forms, holds a biannual symposium, In Praise of the Essay: Practice & Form, in October in New York City. It’s a one-day essay lover’s dream–think the best panels from AWP minus all the insanity. Presentations are made on the essay and all its possibilities, teaching, and publishing. Visit http://www.welcometablepress.org, or check out our Facebook page. Thanks for blogging about the smaller offerings, Richard. Thanks so much, Kim! The comments section of this post is becoming such a resource for me and others regarding good and alternative conferences. Thanks also for your book of essays,I Just Lately Started Buying Wings, which I loved. And of course for your work lately as a publisher of personal essays. I came across your blog through a comment you left on a 100memoirs post. Like books always have, this blog post came into my life exactly when I needed it! I have just begun my journey towards writing as a profession and have been grappling with whether to attend conferences or not. I was thinking I should start at one of the larger ones but after reading your post, and the thoughtful comments, I will start looking for smaller, more intimate ones closer to home! In my fantasy parallel life, I go from writer’s retreat to writer’s conference. In actual life, I finally located a “for real” writer’s group in our area and am going to my first gathering next month. So many resources here, both in your post and from your commenters. Thank you all. I agree, Richard. The best writing conferences are the small ones. And just a few minutes ago I was holding an issue of River Teeth in my hands, reading a wonderful piece by Tom Larson. Richard, thank you SO MUCH for including my workshop. If anyone has questions they can email me at pbalden@aol.com. I also want to plug The Key West Literary Seminar, in case people don’t know about it. http://www.kwls.org/ It isn’t a writers’ conference, but a series of panels of wonderful writers interacting with each other on stage. Each year there’s a different theme; this year’s is Writers on Writers. Some of the writers who will be there are James Atlas, Billy Collins, Mark Doty, Geoff Dyer, Pico Iyer, Jay Parini, Judith Thurman, Colm Toibin, Edmund White. There will be two sessions in January, and hey, you may be burning up now but Key West will look plenty good come January. There are also writing workshops, from Jan. 13 – 17th, and I’ll be teaching one, along with Billy Collins, Jane Hirschfield, Daniel Menaker, Mary Morris, Jay Parini and others. Come on down! I’ve debated about going to AWP for years. In 2013 it’s in late February. My memoir will be coming out in April/May. Do you think it would be worth going at that pre-publication stage? I’ll check out the Midwest Writers Workshop for next year. I’m going to the South Dakota Festival of Books Sept. 28-30. This is a great festival and they attract a great, top-notch roster of writers. In addition, for those interested in Native American writers and literature, there’s much to be gained. I do Rachael, especially if you can carry some advance bound galleys to give to selected folk—editors, bloggers, and the like. For me, the only way to go to AWP is with a head of steam of some kind! Wish I’d known about some of these before my last book! I’ve been attending the ASJA conference for years (and served six years on their board) but feeling increasingly desperate for a place to talk seriously and usefully about craft. Now I know where to go! Conferences can be exhausting; I head into one tomorrow in NYC for three days, BlogHer, and my goals are to find out how to blog more effectively and to push my new paperback into as many hands as will take it and blog about it. The most useful conference for me in terms of inspiration was the old Neiman conference. But haven’t been to it in years. You might take a look at the Mayborn conference in Texas. Great for narrative nonfiction.